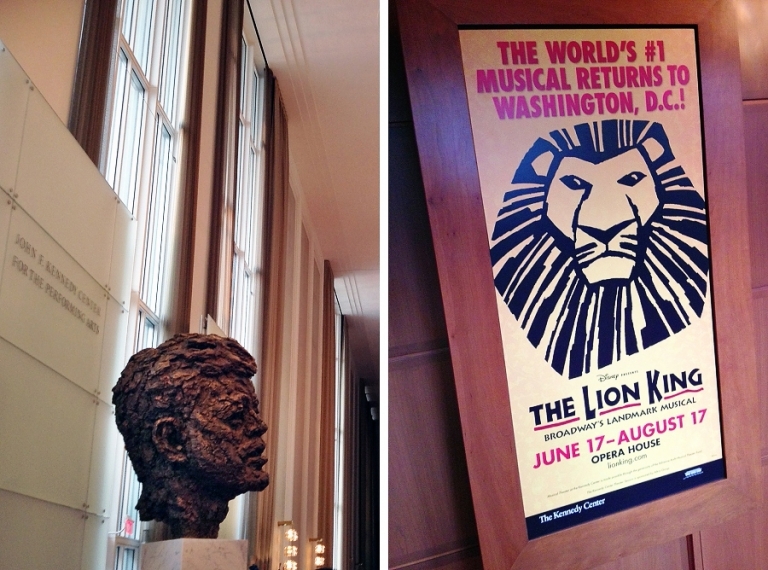 This past weekend, Chris and I were happy to take advantage of our proximity to D.C. to see The Lion King playing at the Kennedy Center. We were also thrilled for the perfect opportunity to try out the new Silver Line on the Metro! We hopped on at the Wiehle-Reston station, which is much closer to our home than the stop we usually use in Vienna. Taking the Metro saves us the huge hassle of trying to find parking anywhere in the city, especially since the weather threatened to be rainy. We almost never drive into D.C. solely for the parking reason, so we can’t wait for the Silver Line to extend all the way out to Loudoun County in a few years. Hooray for accessible public transportation! 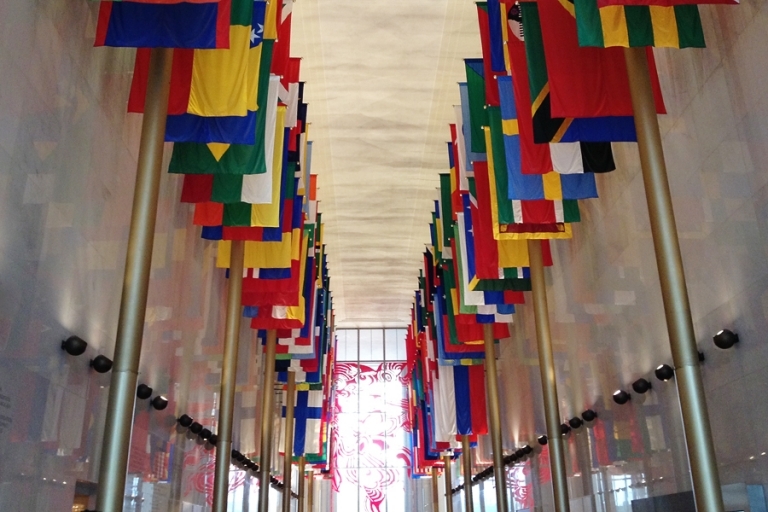 We’ve been to The Kennedy Center a couple of times now, and I can officially say I love this venue for musicals. It’s easy to get to with good parking if you do drive, and it’s a beautiful building with comfortable theaters. We used their complimentary shuttle to and from the Foggy Bottom Metro stop. The shuttle runs every 15 minutes before the show, and then afterward we all queued up for the return shuttle which seemed to pick people up in groups every 10-15 minutes. Thankfully it never rained, so we were fine to wait for the ride back. The last time we were at the Center, we saw Legally Blonde and we parked in the underground garage. Easy breezy. As for the show, it was absolutely wonderful. If you have the opportunity to see it in the next few days while it’s in D.C. or on one of their upcoming tour stops, I highly recommend it! I was blown away by the whole production, and felt mesmerized by the voices, costumes, and puppetry. Tshidi Manye simply crushed it in the role of Rafiki. I didn’t know anything about the show before we went and I barely remembered the animated movie, so I had no idea how it would translate onto the stage. The answer: flawlessly. 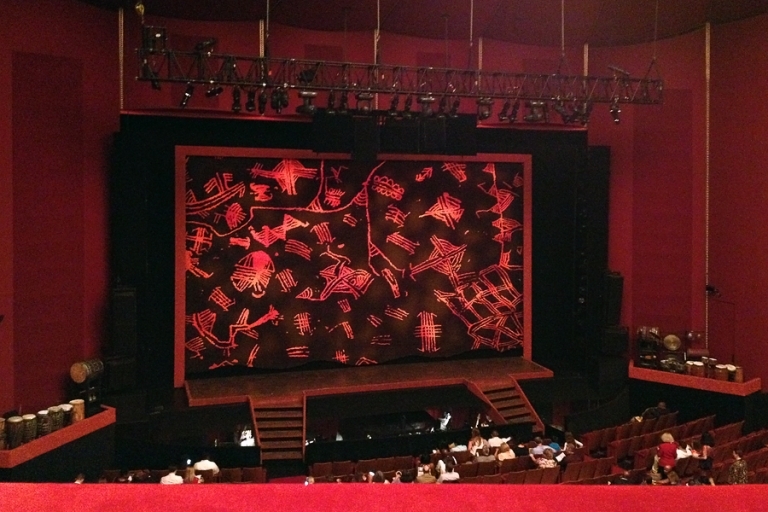 If you want to experience magic, wonder, and thousands of goosebumps like I did, go see The Lion King! The Kennedy Center has a strict policy on no photography or video inside the theater so I don’t have any photos to share, but I did take a very quick no-flash iPhone photo before the show started just to show where we were sitting. (I was guessing that the rule is to prevent anyone from distracting from the performance and/or violating copyright rules, so I think this photo is okay?!) This is one of my very favorite spots to sit – first row in Tier One, so that no one sits in front of us. Of course, I wouldn’t say no to a pair of front-row tickets in the Orchestra section, but these are a little more affordable and easier to find. I waited a little too long to buy the tickets so I did end up having to buy them from eBay, but it worked out great. Hakuna matata‬!